We sell a range of watertight and aquatic polythene bags, also known as watertight fish bags, or aquatic poly bags. They are ideal for handling tropical fish and marine fish as they are manufactured with a 'Watertight Seal' and therefore the material will not leak or split during transportation. 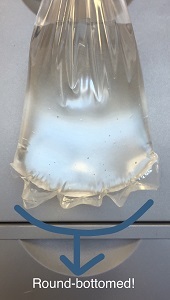 The primary difference of these bags, in comparison to clear poly bags, is that they tend to be longer than usual to ensure that the user can tie the opening end for safe transit.